You’re looking forward to the big game, and you’ve invited all your friends for what should be an exciting day. But now the big questions persist: Do you have enough food? Is my menu going to make everyone happy? What more do you need for a successful game day party? Here are a few simple tips to up your game and make it a day to remember ... win or lose. Take a good look at your living room, den or wherever you’re planning to watch the big game together. Create an open place by removing some clutter to make room for your friends. Pressed for time? Stick random items you don’t know what to do with in a big box or bin and store in another room. Remove extra furniture — like end tables — to make enough room for everybody to sit and move around. We all know how excited we can get when our favorite team scores. Keep in mind that you do need to keep at least that coffee table for all those great snacks you’ll be serving. 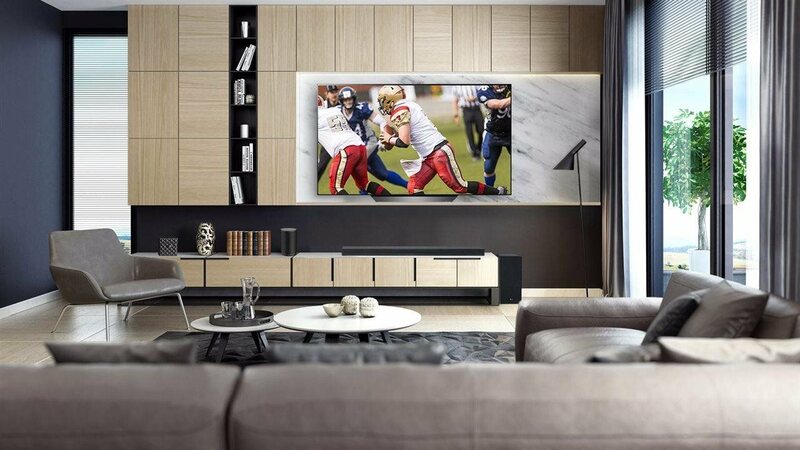 On game day, the right TV makes all the difference, and now is perhaps the best opportunity to invest in that high-tech big screen TV you’ve always wanted. LG Electronics is offering for a very limited time the lowest prices ever for the top-rated and critically-acclaimed LG B8 OLED TV with AI ThinQ. LG OLED’s high-precision images, incredible color and wide viewing angles deliver the ultimate theater-quality experience in your home. The LG B8 OLED TV has 8 million-plus pixels for crisp details, making it ideal for sports. Impress your game day fans with a new 55- or 65-inch model that will make them feel like they’re actually at the game. Chances are, you don’t have bleachers in your home — but do you have enough seating for everyone in the room where you’ll be watching? Don’t try to cram five people onto a three-person sofa. Instead, move a few extra chairs into the room from elsewhere in the house if needed. Think ahead as to when guests may stand or sit — the halftime show is a fan favorite when most people prefer to sit. Plan a variety of drink options, especially if you’re inviting families with kids or friends who prefer non-alcoholic beverages. Make sure to supply alternatives such as flavored water and soft drinks, so everyone can enjoy their drink of choice during the game. Everyone loves game-day snacks, but a few bags of chips and some store-bought dip just doesn’t impress anymore. There are so many crowd-pleasing favorites, from nachos and wings to chili and pizza, but if you’re not a great cook, you don’t need to let that get in your way. Many grocery stores and restaurants will prep a big spread that you can pick up that day. It’s as simple as calling ahead to make your order. Or, if friends are willing, go potluck. Ask everyone to tell you what they’re bringing, though, so you don’t end up with five pots of chili and nothing else. Prep or buy more food than you think you’ll need, just in case the game goes into overtime! No matter which team you’re rooting for, your game day party will score big with the right setting in your home, delicious snacks and the perfect viewing screen to bring all the action to life. Find out more about your viewing options at lg.com and you'll come out as this year’s MVP.